Wit is often thought of as simply being funny. But wit is more than just having a knack for snappy comebacks. There is the serendipitous wit of scientists, the crafty wit of inventors, the optical wit of artists, the improvisational wit of musicians, and the metaphysical wit of philosophers. Wit is the quick, instinctive intelligence that allows us to think, say or do the right thing at the right time in the right place. James Geary explores every facet of wittiness, bringing the subject to life by writing each chapter in a style that exemplifies a different kind of wit. The chapter on witty verbal repartee is written as a dramatic dialogue; the chapter on the neuroscience of wit is written as a scientific paper; the chapter on the spirituality of wit is written as a sermon. There are also sections written in jive, rap and the heroic couplets of Alexander Pope. Wit’s End shows how wit is a state of mind as well as a sense of humor and why wit and wisdom are really the same thing. Read an excerpt on puns from The Paris Review. Wit’s End juggles scholarship, humorous anecdote and critical insight with a diabolical, almost sinister dexterity. No shrinking violet, Geary fully intends to strut his stuff, to glitter and beguile, and he does so with remarkable ingenuity and chutzpah ... As the playwright Sacha Guitry so shrewdly observed, “you can pretend to be serious, but you can’t pretend to be witty.” Happily, Geary manages to be both. Geary is a keen storyteller, promiscuous with quotes and figures. One could do worse at a cocktail party than simply opening his book at random and reading aloud. Mr. Geary writes not just playfully but also with panache ... Crucially, instead of analyzing wit to death, Mr. Geary chooses to embody it ... [His] chief success is in conveying the power of wit to refresh the mind. With humour and verve and by the variety of his style, Geary shows wit to be multifaceted, subtle, ambiguous and akin to wisdom. An entertaining exploration of how intellectual dexterity manifests itself in both verbal and visual form ... Geary is undaunted by the risk anyone writing about the subject of being funny takes: spoiling the joke by explaining it. Refreshingly, he shows here that he's fully equal to the task, enhancing our appreciation of how true wit can both amuse and enlighten. An exhilarating romp, entertaining and enlightening… Readers roaring with laughter at outrageous puns one moment find themselves carefully assessing psychological studies the next… Geary’s own puckish style - mischievous and unpredictable - itself sparkles with wit. Geary takes an unusual approach to writing about wit. The chapter on verbal repartee is written as a dramatic dialogue. For the neuroscience of wit, he delivers a scientific paper. A quirky approach for a quirky topic. A playful book that celebrates all forms of wit. To add to the fun, [Geary] writes each chapter in a style that mimics the topic under discussion [and] has great fun with the many different styles ... "To see clearly, look askance," Geary advises. He heeds his own advice to entertaining effect. 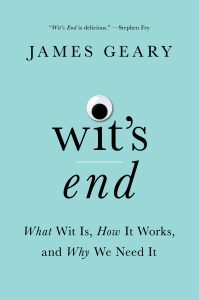 Audiobook review: James Geary's essays on wit ... give narrators David De Vries, JD Jackson, and Janet Metzger vocal workouts ... Geary is providing informative observations on wit [that] could help listeners craft better puns as it reveals the secrets of silliness. If you want to learn about the evolution and nuance and complexity of the English language, read this book. If you want to be joyously surprised to learn things you didn't know, read this book. If you want evidence that a skilled, committed writer can inhabit different voices from various backgrounds - and do it with the kind of excellence and sensitivity that must be required of anyone attempting such an endeavor - read this book. "James Geary deftly accomplishes an impossible task: explaining why things are funny while simultaneously making you laugh. Wit’s End is a delight! It’s entertaining, it’s informative, and it’s a breeze to read. I’m still smiling long after I finished reading it." "Whoever was the foremost authority on this topic is now second most." "Comedy is famously impossible to describe without destroying it, so James Geary — in this entertaining and informative and funny book — makes a very smart and effective move: he does the police in different voices. He embodies the many different forms that wit takes, from poems to jokes to jive to rap. In a time of constant, unintentional humor, here is a purposeful and valuable reminder that sometimes it's on purpose and sometimes it's very nearly life-saving." "James Geary has produced a rich cornucopia of wit and its origins in the wittiest literary way possible. A delight." "Playful, fiercely intelligent, silly, funny and immensely informative - [Wit's End] makes for a breathless read that leaves you feeling enormously enriched. The reinvention from chapter to chapter is a masterstroke and keeps the subject matter joyously buoyant." "If you've ever spent hours overanalyzing your favorite standup special or sitcom episode, this is the kind of insightful, carefully reasoned deep dive you'll love."